Taormina Jewelry is "made to Order" and ships in 7 to 10 business days. But for many reasons like special occasion, Holidays, upcoming trip, you just need sooner. By upgrading to Express Shipment We are basically bumping your order to the front of the line and doing some overtime. 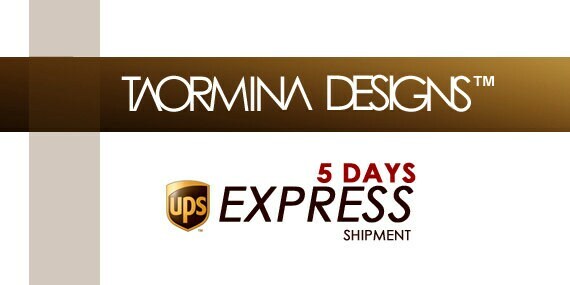 Plus instead of shipping using our complimentary USPS Priority mail, we will ship using UPS Express. Therefore Your order is guaranteed to be received up to 5 business days from order date. Unfortunately, UPS cannot be applied towards orders being shipped to a P.O. Box. $35.00 UPS Express Shipping is available for orders being shipped within USA. Depending on your location (outside USA) additional shipping cost will apply. Arrived on time and safely! Great to have a shipment upgrade! Thank you!